The Black River (also called the Black-Lamington) is only about 12 miles long from beginning to end, but on the way it slices through the lives of tens of thousands of New Jerseyans. It hits them where they live, work and play. The river highlights the natural beauty of this corner of the state, and it flows through many of its major controversies about how land and water should be used. In its middle, as it roars through the hemlock groves of Hacklebarney State Park in Morris County, the Black River puts on a show of beauty, peace and power that can make a visitor forget where he is or why he came ­ and cease to care. River headwaters are always obscure. You can stand with one foot on each side of the Mississippi at its headwaters in Minnesota. The twin headwaters of the Nile were uncertain until the mid-19th century. Although some think the Black River begins further north in Roxbury, an official sign announces that it begins just south of the Route 10 jughandle turn that leads drivers either onto the Sussex Turnpike or back to Route 10. If it weren't for the sign, you wouldn't know the river was there. It begins almost apologetically, as if to say, "Excuse me, I'm just going to trickle through this tall grass for a little ways, and then I'll pass under the road and you won't even know I'm here. Please go on with your shopping and shuttling, and don't think about me at all." The river seeps through tall grass and runs west along the Sussex Turnpike for a few yards, then passes under the Turnpike. The Black River meanders through the neighborhoods of Roxbury and Randolph townships for about a mile, and then enters the Black River Wildlife Management Area in Randolph Township's Ironia section. Here, the river changes character as it stretches out in a marsh, several hundred yards wide in some areas. The wildlife being managed here ranges from several varieties of goose and duck to beaver, bear, fox and lynx. You can get into the Black River WMA at either of two access points along Dover-Chester Road (Route 513), which crosses the northern edge of the WMA. From either one, a visitor can find foot and bicycle trails that lead south into the marsh. In the winter time, this is duck and goose hunting country. In the spring, people come to look at birds, rather than to shoot them. They also come to fish, to stroll and to ride bicycles. The state of New Jersey stocks the Black River with trout at several points along its course. There are also native species of fish in the river. Access is available to anglers in Morris County's Black River Park, in Hacklebarney State Park, and near the village of Pottersville in Bedminster Township, Hunterdon County. The river is also a breeding ground for native trout. When it comes to strolling, there are plenty of places to do it and lots to see. Begin with flowers in the WMA. 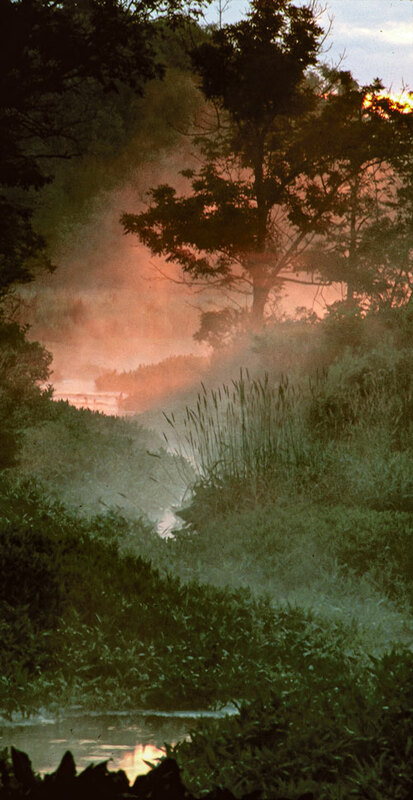 The marsh turns from gray, wet, and cold to an explosion of color in the spring. The Patriot's Path, part of Morris County's trail system, runs along the east shore of the river, on the bed of an old branch railroad, from Ironia Road in Randolph Township to the Pleasant Hill Road bridge in Chester Township. The path is suitable for biking and hiking. If you're headed south on the path, distracted by the flowers and birds and the general racket of the woods in spring-time, you may miss the hermits on your left as you near Pleasant Hill Road. That's fine with the hermits. 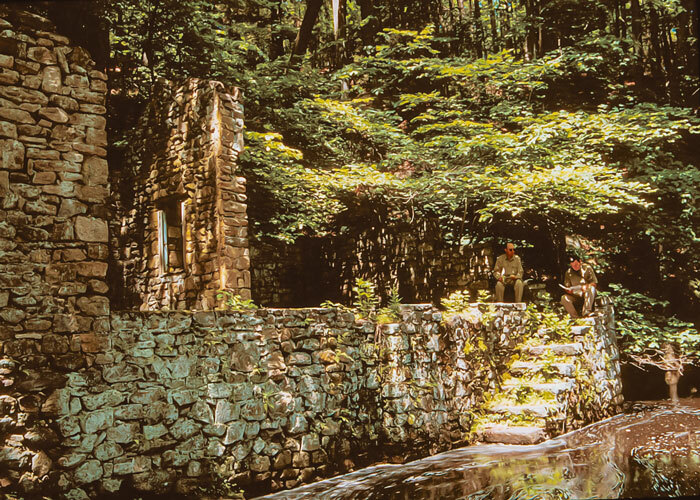 Two communities of Catholic hermits, the Bethlehem Hermits and the Carmelite Sisters, live in a grove of eastern hemlocks on the eastern bank of the river. A separate, private road leads to their hermitages. Their lives are intentionally silent and sacrificial, and while they're kind to visitors, their home is not a theme park, and they prefer visitors who are spiritually motivated. Then, consider the Willowood Arboretum, operated by the Morris County Parks Commission in Black River Park, just north of Pottersville Road and west of Route 206 in Chester Township. The arboretum has its own set of trails, and its staff conducts educational programs for the public throughout the year. 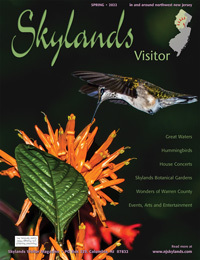 The 130-acre arboretum is home to 3,500 kinds of native and exotic plants. It even boasts a Dawn redwood tree that is pushing 100 feet in height. And this is the first place where the water is deep enough to try canoeing or kayaking. "From the Ironia bridge to the Pleasant Hill Road bridge can be a three- or four-hour trip," says Ken Caro, a member of the Morris County Parks Commission and the former mayor of Chester Township. "When I was mayor, we used to take 20 canoes down the river every spring. It was a great town trip, because (the Black River) is the defining natural feature of the area, and quite frankly, if you live in a house or a development in Chester, (canoeing the river) is like being in the movie 'Deliverance'. I mean, once you get back in there, you don't see a car or a person for two or three hours." Caro adds a caution, however. In this stretch, the river diffuses through the marsh into many channels, and only the main channel is sure to take you through. To stay in the main channel, it helps to be able to see the bridges crossing Pleasant Hill Road and Hillside Avenue, and for that, you need daylight. "You shouldn't (canoe in this part of the river) in the late afternoon," he says. "It's too easy to get stuck out there all night." Ben Spinelli, a Chester Township lawyer and Caro's successor as mayor, agrees. "My wife will swear there is no such thing as the Black River," he says. "I took her out there in July, and there wasn't much water. This time of year there are lots of channels, and you have to be sure you're in the right one. What looks like a one-mile paddle may turn out to be a three-mile paddle." The Black River comes out of the swamp and soon cuts through a gorge in a series of waterfalls. As it moves through the gorge, the river picks up tributaries ­ Bamboo Brook, Rinehart Brook, and Trout Brook. In this rough and ready stretch, the river changes its character again, boiling and booming over rocks and between house-sized boulders, echoing off the gorge walls and playing tag with the sunlight seeping through the branches of the hemlocks overhead. There are trails that lead to the gorge from the Elizabeth Kay Environmental Center in Black River Park and from the headquarters of Hacklebarney State Park. "There's a new trail that starts at the Kay Center, goes down along the river to Hacklebarney Road, and cuts over to Bamboo Brook Environmental Center (also in Black River Park) and the Willowood Arboretum," Spinelli says. "I hike all over New Jersey, and this is my favorite spot." There is also relatively easy access to the gorge through the state park, but there are some potential challenges for the unprepared day tripper. The trails from the headquarters (there are several to choose from) lead up and down hills but are laid with fine gravel and cinder, and so are relatively easy walking. An investment banker in street shoes out for a stroll would have no trouble making the hike. But once along the river, the trail turns rugged and rocky and ­ in high water ­ a bit wet. Although maps are available from the park headquarters, they aren't strictly accurate along the river, and the trails themselves are unmarked. If you're up for a mild challenge, none of this should deter you from the trip, but if you're elderly, disabled, or have small children with you, the riverside part of the trail may be more than you can handle. Wherever you go on the Black River, you can see evidence of the changing human attitude toward the river, of its uses and misuses, and of efforts to preserve its beauty into the future. Like many other rivers in the east, the Black River was used by early European settlers for power. Cooper Mill, in Black River Park, dates from 1826, when Nathan Cooper built the present building to mill flour. Cooper was no innovator; there had been a mill on the site since the 1760s, when Isaac Younglove first harnessed the stream's power to mill flour for local farmers. 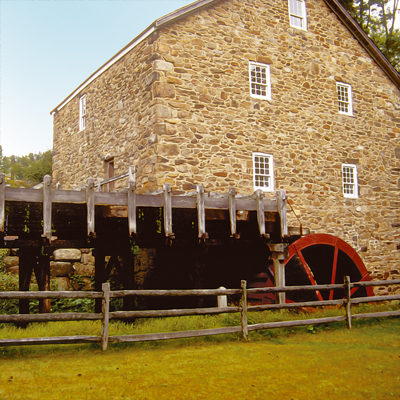 If you visit the mill this spring, you may have the pleasure of watching the water wheel and power shafts do their work, and chat with staff decked out in period costume. Visit the restored Cooper Mill and witness the power of the Black River harnessed to grind grain into flour by massive 2,000 pound mill stones. The dynamic social, agricultural, and technological history of the area surrounding Cooper Mill once known as Milltown is brought to life. The mill is open on weekends in May through October from 10am to 5pm. In July and August the mill is open Wed-Sun, 10am-5pm. Up and down the river, from the 18th to the early 20th centuries, the river was used to power mills and forges, and you can find the remains of these industrial uses along the trails, especially in Black River Park. Some of those remains indicate that more than mere water power was exploited along the river. "From Cooper Mill, if you walk down to the old railroad bed, and turn left toward Hacklebarney (State Park), you'll come upon an old (iron) mining area," says Caro, of the Parks Commission. "There were shaft mines, pit mines, and all sorts of artifacts when we first took the property over. There isn't much left of the old forge, but there is blackened soil and slag. There was a forge there in the 18th and 19th centuries. We came across this old sheriff's document from the 1780s advertising the property for sale, along with '20 black men experienced in working iron'. Working iron was high-tech. So the notion that black slaves were just used for menial work isn't true." In the early 20th century, it appears that some landowners along the river realized they owned a treasure, and wanted to pass it on to a wider audience than their own families. "This woodland was given to the State of New Jersey by Adolphe Edward Borie to be forever preserved for the benefit of youth, and in memory of his mother, Susan Parker Borie (1835-1913) and her granddaughter, Susan Ryerson Patterson (1890-1921), two women of rare vision, character and courage," says the plaque at the entrance to Hacklebarney State Park. Bamboo Brook Outdoor Education Center, in Black River Park, is based on a gift of land and buildings from William and Martha Brookes Hutchson, who farmed the 100 acres between 1911 and 1959. Janet McMillan, the trails coordinator for the Morris County Parks Commission, says the commission's preservation work is really just a continuation of Martha Hutschon's work. "She was one of the first women to be a trained landscape architect in the United States," McMillan says. "They have some incredible ponds and beautiful water lilies, and the center is open year round." 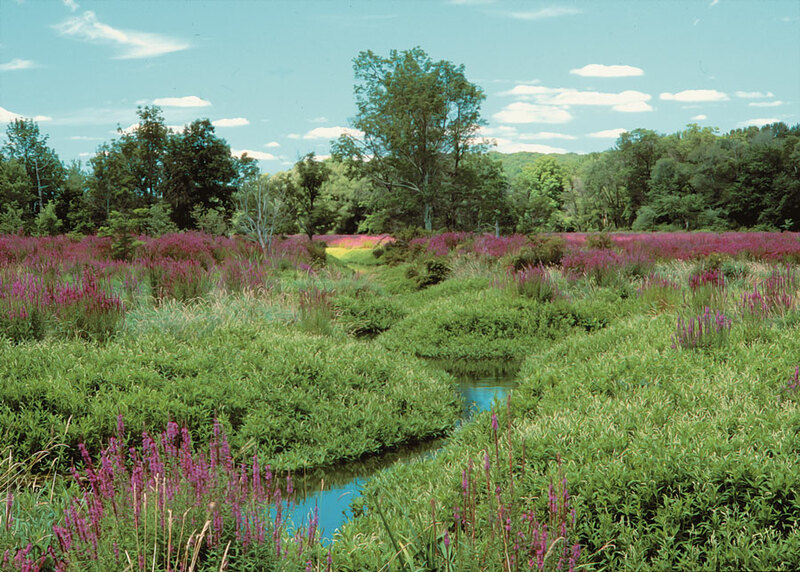 Morris County, some of its municipalities, wealthy individuals, and the state government have combined over the years to surround much of the Black River watershed with publicly owned land. Spinelli, the mayor of Chester Township, says that he watches large properties in his township, so that when they come up for sale, he can coax the township, county, state, private conservation groups ­ or all four ­ to "race with the developers" to buy and preserve the parcel. "Our whole zoning scheme is designed to protect natural resources in the township," Chester Township's Mayor Spinelli says. "When we re-did the master plan, we zoned to keep the density down. We keep it off the steep slope, out of the wetlands buffers, we zone to protect the groundwater, and make certain that all the homes can be self sustaining from a private well and septic system. All the streams are trout production streams. 150-foot buffer on the edge of the wetlands." In Hunterdon and Somerset counties, where the Black River becomes the Lamington, it's bordered mostly by private property. The river changes character again here; coming out of the hills, it flattens and broadens with the landscape. Black River Road runs along it and crosses it several times, leading the visitor into the village of Pottersville, in Hunterdon County, where there is public access, and where canoeists can put in for the north branch of the Raritan. But between Pottersville and Lamington, in Somerset County, while the drive is beautiful, public access is rare. "Those folks (in Hunterdon and Somerset) are going to have some decisions to make if those large properties go on the market," Spinelli says. Peifer, whose organization monitors water quality over the watershed of the North Branch of the Raritan ­ including the Black River ­ says the Black River is in pretty good shape, as New Jersey rivers go. "It's one of the best streams in the northern part of the state," he says. "In terms of our established monitoring stations operated by the state of New Jeresey, it shows that by most parameters it's better than standard, and it's historically been that way." But challenges lie ahead. New Jersey is in the fifth year of a drought, and the groundwater that supports the Black River has been depleted. Rainfall has been off 9 percent for the past five years ­ a time when demand for water for all purposes has gone up. "It's like taking 9 percent out of your checking account for five years, and not putting anything in," he says. Peifer says his monitoring station on the lower stretch of the river, near Pottersville, has shown increased sodium chloride ­ salt. That, he says, is because we have more roads in the area, and we put more salt on them in the winter time. The salt enters the stream when the snow melts. He's also concerned about property owners' tendency to cut down vegetation at the bankside, which exposes the water to more sunlight, raising its temperature, and risking the viability of trout. But despite Peifer's concerns, he and others who know the river system remain optimistic. They agree with Spinelli, who says, "For us, the river is a treasure."